What the Heck Is Postmodern Dance? 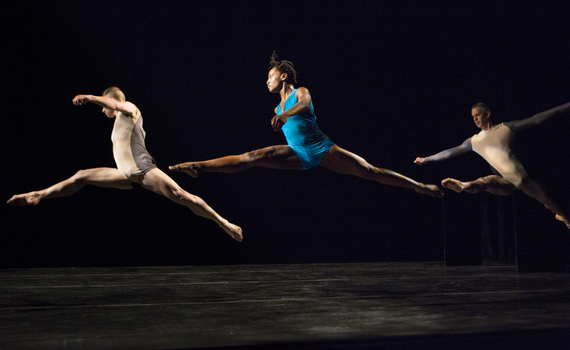 For the premiere performance of the 2015/16 Dance Center of Columbia College Presenting Season, the Stephen Petronio Company's Bloodlines promised "to honor and curate a lineage of American postmodern dance masters." In this endeavor, the program decidedly delivers. The program comprises three works: one by Petronio himself and the other two by postmodern choreographic giants Trisha Brown and Merce Cunningham. Trisha Brown's Glacial Decoy opens the show. The work originally premiered in 1979, and we learn through both the program notes as well as through Petronio's post-show discussion that as the first male member of the troupe, he was brought on during the development of the all-female quintet and confined to the sidelines for its production and performance. The lights come up on a scene already in progress. Two dancers clad in diaphanous gowns duet in silence. Others dance out from and back into the curtains while a four-panel black and white photomontage of quotidian Americana designed by visual artist Robert Rauschenberg rhythmically progresses from left to right. The cacophonous silence hangs over the piece as my seat squeaks, an audience member coughs, and an ambulance races down Michigan Avenue. The choreography is such that each step, whether a gestural roll of the shoulder or a more virtuosic kick, is given the same careful consideration. Limbs hinge at the joints with ease and dancers' pathways turn on a dime. As Brown's first piece for a proscenium stage, the observer is invited to consider this a mere snippet of a larger event taking place beyond the confines of the stage itself. Stephen Petronio's Non Locomotor, despite its name, opens with the four dancers bursting onto the stage with dazzling leaps. All four wear structured, geometric short unitards with the lone woman in a bright teal-blue and the men in muted tan and grey. The piece shifts from staggering physical feats to intimate weight-sharing phrases and back again. The dancers are all sinew with lines for days. In some moments, the bass-heavy throbbing of the sound score and the raw physical prowess give the piece the vibe of a very badass Under Armour ad. The dancers are at times spatially confined to spotlights, and in these non-locomotor phrases energy pulses up and down the spine and to the tips of the appendages. While Petronio's work is flashier than that of his postmodern ancestors, it shares an affinity for form over narrative. The viewer can superimpose meaning onto the work, but crafting a story hardly seems to be Petronio's objective. Merce Cunningham's iconic Rainforest, first performed in 1968, rounds out the program. Andy Warhol's capricious silver balloon set pieces and a meandering David Tudor sound score accompany the familiar Cunningham movement aesthetic. More than any other postmodern choreographer, Cunningham developed a codified movement system to train his dancers and facilitate his visions. In the post-Cunningham era, to set such historical works onto new groups of dancers necessitates navigating the tension between a desire to preserve the purity of the piece with the reality of performers imbued with varying technical backgrounds. In my humble opinion, this is what will keep this work alive. This is not merely an exercise in embodied archival, but rather the chance to breathe new life into historical relics. Interestingly, Petronio noted in the post show discussion that part of the consideration in staging Rainforest was that as an early work the Cunningham vocabulary was less developed, making it an easier entry point for his dancers. Throughout the piece the dancers travel through the space unphased by the Warhol balloons, bumping them out of their way as they move (sometimes with a dramatic flair). Sharp, staccato steps punctate smooth promenades and adagios. Considered one of Cunningham's nature studies, for me it evokes not the humid, lush glow of a rainforest so much as the mysterious, impish play partially obscured by the dense flora. Postmodern dance often values movement for movement's sake rather than movement as a vehicle for storytelling. One gets the sense that the audience happens upon these events by accident. The scene existed before the audience arrived and will continue long after they are gone. The world constructed by the choreographer extends beyond the borders of the stage, and we are witness to only a slice of the action. Postmodern choreography seeks to complicate the relationship between music and dance. The dance is not dependent on the music, it just occurs in the same time and place. Brown's Glacial Decoy shows us that music is not a prerequisite for rhythmic, dynamic dancing. The postmodern giants are also known for collaboration with visual artists as is the case with Brown and Rauschenberg or Cunningham and Warhol. As Merce Cunningham once said, dance "gives you nothing back, no manuscripts to store away, no paintings to show on walls and maybe hang in museums, no poems to be printed and sold, nothing but that single fleeting moment when you feel alive." Without such tangible artifacts, the most authentic way to preserve these works is in their original medium: live performance. We are lucky Petronio has committed to such an undertaking. Bloodlines is an ongoing project, and it will be exciting to see what the next program looks like as he continues to trace the lineage of postmodern dance.